Di-Vetelact is a specially designed formula that is available in powder form. It is a low lactose animal supplement which is ideal for all the small animals. It can be used as a milk replacer for orphaned and early weaned animals. 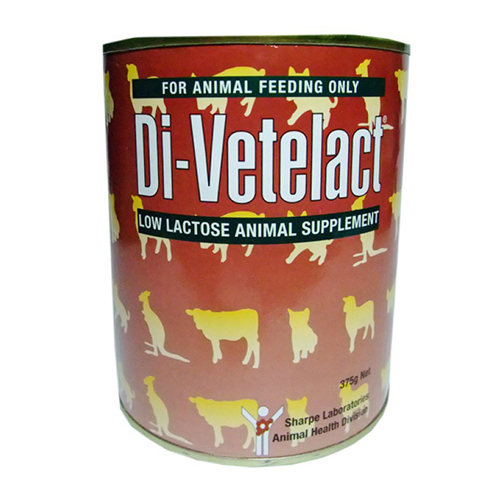 Divetelact converts lactose component into easily digested glucose and galactose. Divetelact can be administered on puppies, kittens, rabbits, foals, lambs, calves, piglets and other furry animals. Lambs, Native Animals, Rabbits, Kittens, Piglets, Puppies - Start on dilution A and gradually increase to Dilution B over 1 week. Dilution A: 1 scoop (9 gm) powder to 60mls warm water. Dilution B: 1 scoop (9 gm) powder to 40mls of warm water. Suitable for puppies, kittens, rabbits, foals, lambs, calves, piglets and other furry animals. Nutritional supplement for pregnant and lactating animals. Sealed container should be stored in cool, dry place. Once opened, keep lid sealed when not in use and for best results, use within one month of opening. If the animals develops diarrhoea when starting on dilution A or changing to dilution B, reduce the dilution to ¾ strength for several days, then gradually increase back to the required dilution once the diarrhoea has resolved. Lactose hydrolysed skim and whole milk solids, dried vegetable oils, dextrose, dried glucose solids, casinates, lecithin minerals, taurine, vitamins, mixed tocopherols and emulsifiers. This lactose supplement works a charm on my young two rabbits. Wonderful product!